At least 60% of the UK population suffer back problems. There are many causes for back pain and one of those causes is a spine which becomes inflexible. In simple terms, there are 17 vertebral bones from the bottom of the neck to the base of the spine. If we imagine each of these should allow an element of rotation and flexibility, then if any of these joints become seized it begins to cause problems in overall flexibility, resulting in pain. Physiotherapy is an effective treatment for improving spinal flexibility, however a physiotherapists ability to manipulate spinal vertebrae is limited by the force they can apply with their hands. Theraflex robotic spinal manipulation provides the physiotherapist with a powerful technology to manipulate the whole spine with ease. How Does Theraflex Spinal Manipulation Work? Theraflex has three modes of operation, each of which can be minutely adjusted for force and speed, thus matching the patient requirements exactly. On this setting, the device rapidly taps on the muscles either side of the spine. By running this up and down the spine, the physiotherapist is able to stimulate muscle relaxation the whole length of the spine quickly and effectively. Most patients find this setting extremely comfortable and relaxing. The second stage of treatment involves stimulation of the spinal reflexes. This is achieved by a gentle tapping over the full length of the spine, triggering the spinal reflexes to create further relaxation in preparation for spinal manipulation. In the final stage of Theraflex treatment, the physiotherapist is able to manipulate each neighbouring vertebrae to move independently of each other, reducing the friction between them. In practice, the treatment mobilises the facet joints between each pair of neighbouring vertebrae. 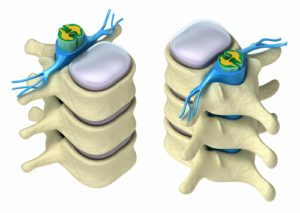 The net result of this treatment is to regain the flexibility in the full length of the spine as originally intended. To achieve this, several treatments may be required, as each treatment progressively improves flexibility. Theraflex as a maintenance treatment helps keep the spine supple and prevents many of the pain problems associated with a stiff spine. This treatment has helped golfers improve their handicap by enhancing the smoothness of their golf swing thanks to increase spinal flexibility. For more information, please visit the Theraflex website.